Does anyone know why the tag on my 1960 Bonneville Convertible says "66" for trim? All the trim codes for this year are 3 digits and they all start with 2. I read somewhere that someone who had a trim code that was 68 was "short" for 268. Strange and suspect. 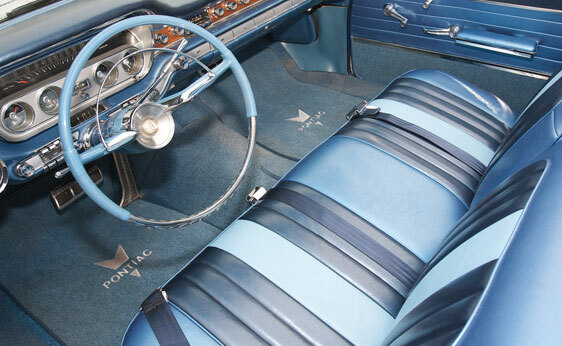 But if "66" is short for 266 it would confirm what I believe that my interior should be blue. Is there any definitive source for decoding 1960 Pontiac trim codes? I can't seem to find any. How would I go about sourcing the correct colors for this? Who has this information? I cant seem to find it anywhere. If you can find a local re-upholstery shop they should have all of this info available, in addition to samples, and can source everything. At least that was the case when I looked into getting some material to repair the trim on my doors on my '86 several years back.